Through Utrecht, the landscape becomes a shade lonely. 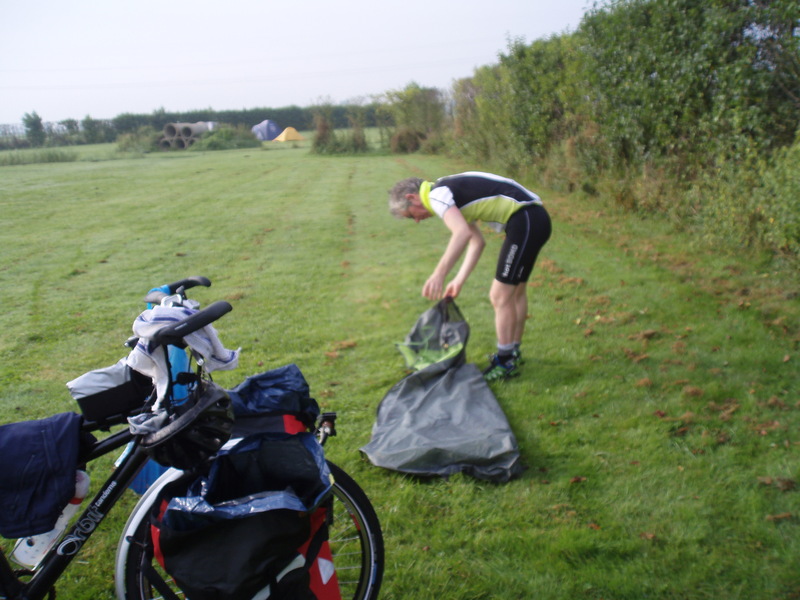 We stopped at Bunnik, a small town to the east of Utrecht; the campsite (left) was a good metaphor for the area. Getting to the campsite involved scaling a daunting bridge over the railway with the loaded tandem (see below right). Although there is a ridge for the bicycle’s wheels, the weight and length of the tandem made it a challenge. 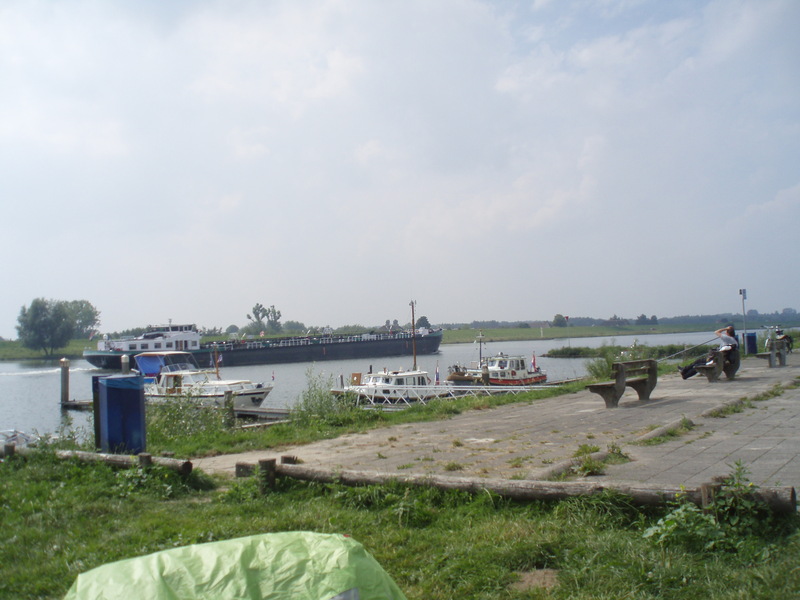 A very pleasant 20 kilometers further one encounters Rhenen where the river becomes more familiar – it is navigable and the barges ply their trade. We bought some food at a nearby deli and took it to the river to eat – it was also an opportunity to dry the tent (which can be seen in the foreground of the picture, left). The Rhine path, however, remains sporadic, with frequent detours that, in some cases, take cyclists some distance away from the banks. 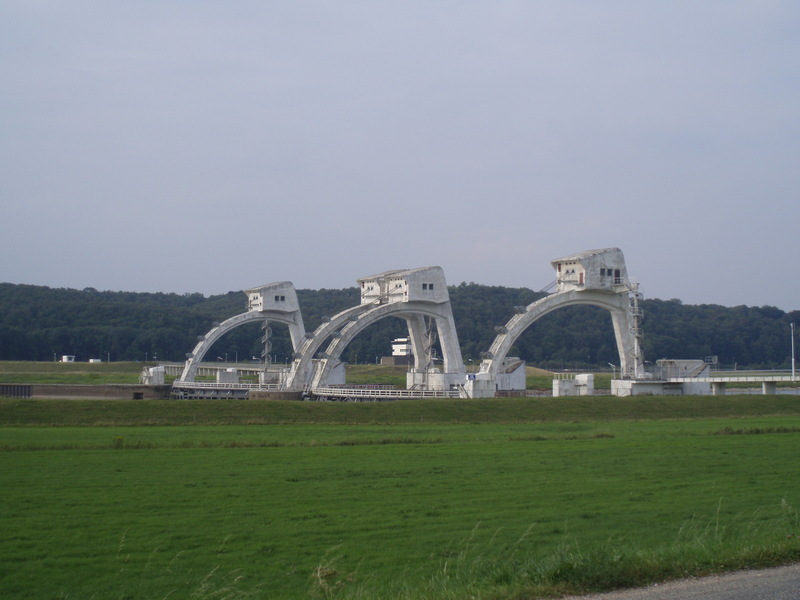 The Rhine features are sometimes other-worldly, or at least other timely (see below right). The features that facilitate the management of the river, its flows and direction, are many and interesting subjects. 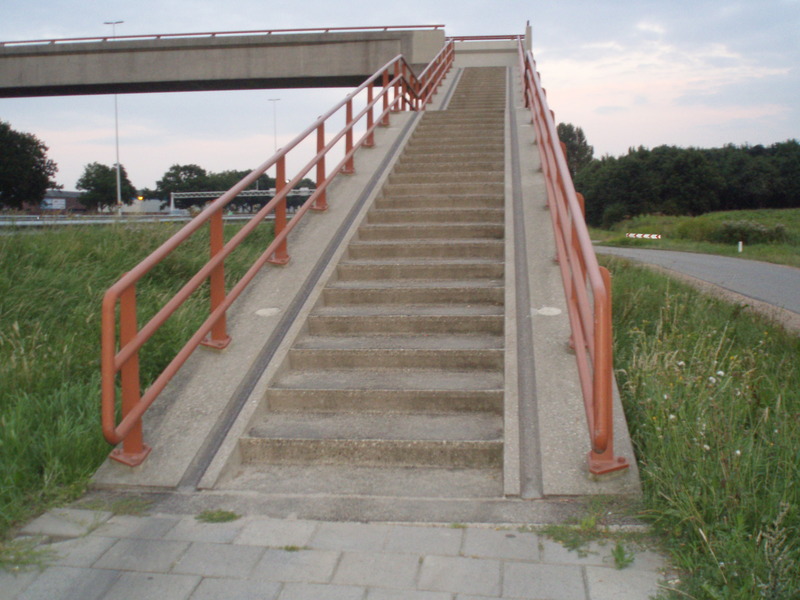 The feature below right is to the west of Arnhem approached here on the south bank which we selected in order to avoid the centre of Arnhem at peak time (a bit of learning from our experience in Utrecht – albeit with the consequence of not seeing the city itself). It is a lonely approach and is the precursor to a lot of loneliness punctuated by many seemingly lost villages. Each year – for one Saturday evening – the museums in Munich stay open late. For 15 Euros one can purchase a ticket that gets access to the majority of museums and galleries in the city and ‘free’ travel on the buses that visit the museums split into four groups – Central, West, Schwarbing and East. This year – 2012 – we decided to join in. There is a certain serendipity as to where one ends up. Having tried the Max Planck Institute, we opted for the Schwarbing bus and the BMW museum. My first time. This museum is pure marketing – or propaganda. With that in mind it can be enjoyed. The building clearly borrows from the Guggenheim in New York in its bulbous appearance and interior walkways. The artefacts inside are immaculate. These range from cars, motorbikes, engines, film footage and marketing/advertising materials. Whilst the museum says little about the company’s history in terms of its Nazi affiliations, some of the film footage of racing success in the 1930s cooly displays the Nazi symbols and sentiments of the time. The museum does not try to over display. 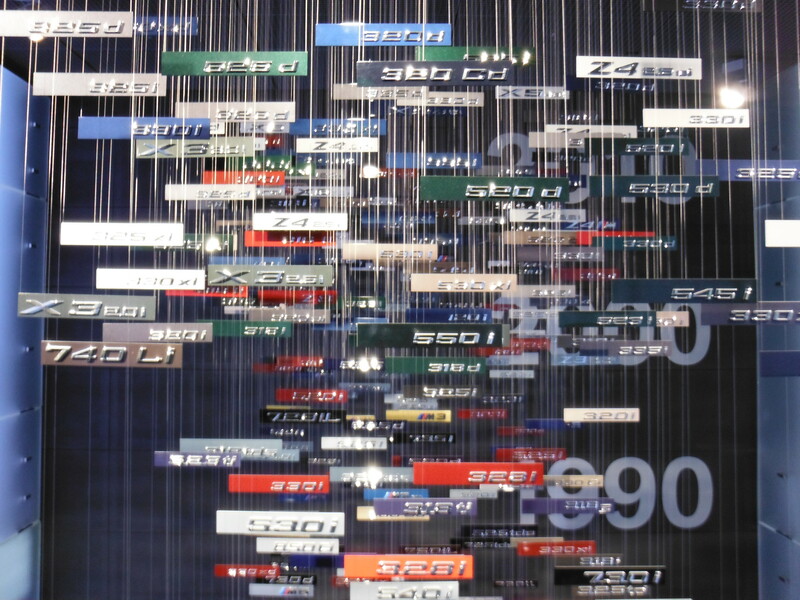 There are some fine examples of vehicles, but the displays are not exhaustive. The room on the left is a good example of the museum’s approach. It is almost a case of the designers believing – probably rightly – that the exhibits speak for themselves. They are instantly recognisable – distinctive. Unmistakably BMW. However, some of the vehicles seem out of line – though a BMW narrative is wrapped around their inclusion. 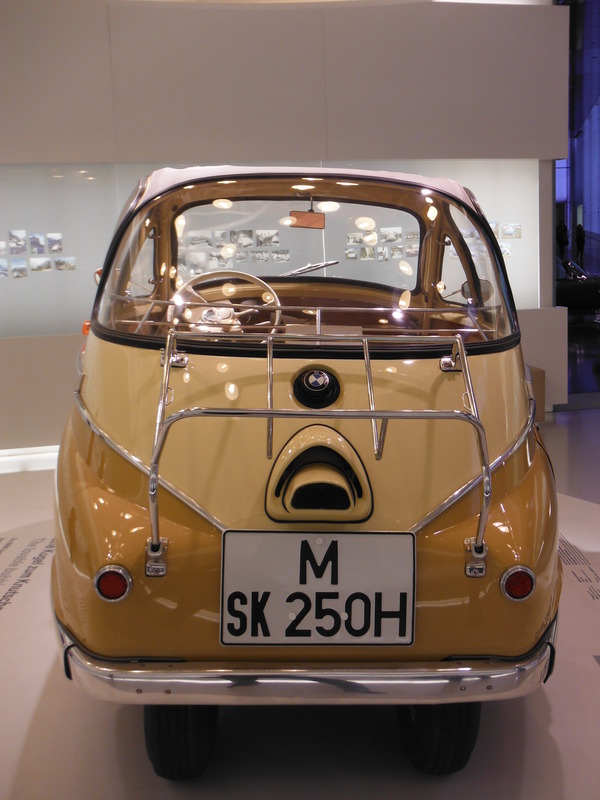 For example, the Isetta bubble car. Far away is this vehicle from the high performance BMW products that preceded and succeeded it. Manufactured under licence from the Italian firm, Iso, which also designed and manufacturered refridgerators (see http://en.wikipedia.org/wiki/Isetta), the Isetta apparently buffered the company against hard times in the 1950s. The gallery’s walls are decorated with splendid period photographs of the German public taking their Isettas to places they presumably were not designed for; for example, the Alps. Television advertising footage is also to be seen. The museum goes to great lengths, however, to spell out its design philosophy. They heap it on, just in case it was missed. 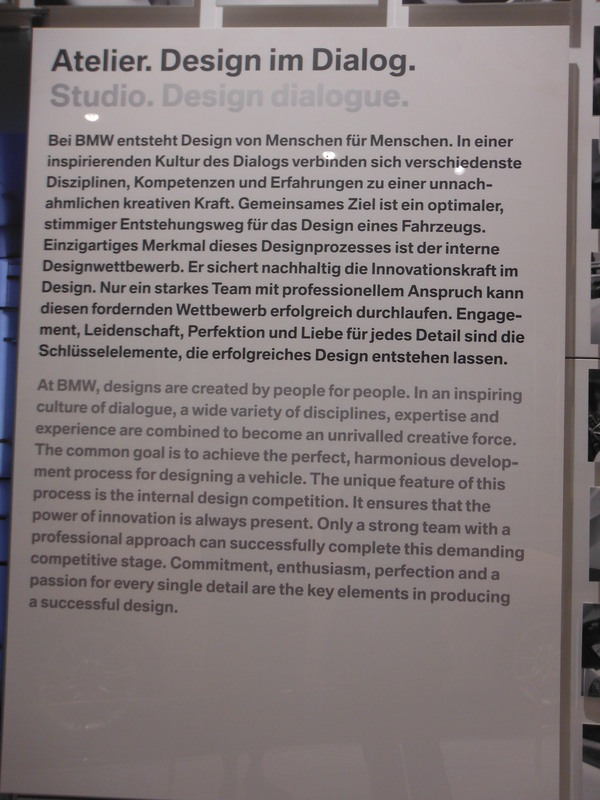 The panel on the left is typical – written in German and English, the design philosophy is spelled out – ‘power of innovation’; ‘strong team’, ‘professional approach’ and ‘perfection’ are used to capture its essence. There are also many references to emotion engendered by careful selection and use of materials and colour in the interior. 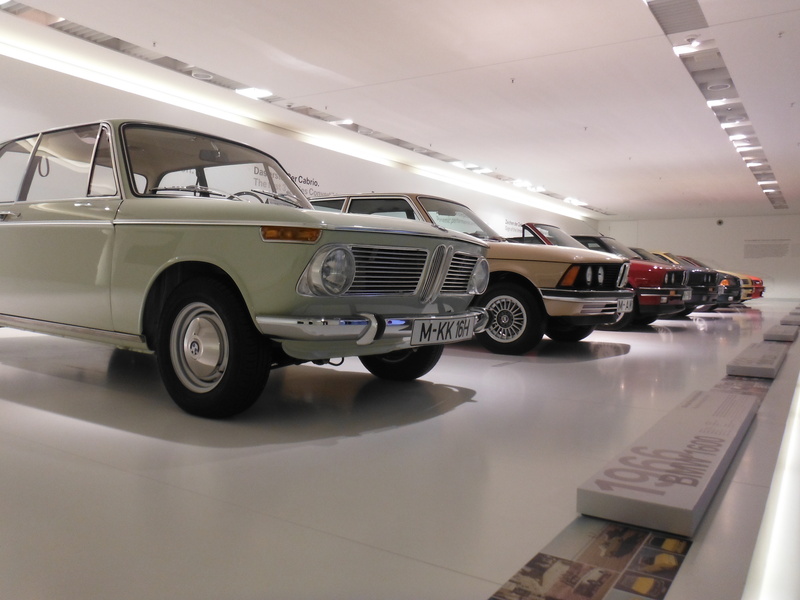 The museum is only one part of the complex that constitutes what one might call the BMW quarter of the city. Opposite is BMW Welt – housed in a post-modern building that successfully conveys power, influence and intent. The bendy Daimler bus took us swiftly back into the city. BMW never got into buses, oddly. The S-Bahn had a signal failure. Being stuck in a crammed stationary train for 30 minutes in the early morning brought us back to reality. Bigots. Nick Clegg nearly used the word – but pulled back when he was challenged by the former Arch Bishop of Canterbury, George Carey, amongst others. Now I use it in connection with the case of Michael Black and John Morgan who won their case against the bigotted Christian Bed and Breakfast owner, Susanne Wilkinson, who refused them a room. Backed by the Christian Legal Centre, Susanne Wilkinson spuriously defended her bigotry. But now we learn that it was not their homosexuality that was the issue, but rather that they were not married. Jonathan Overrend on Radio 5 Live on Thursday evening (18 October) failed to follow through on that. It is laughable to suggest that any hotel – even her unwelcoming microbusiness – would contemplate turning away a heterosexual couple in a similar situation. And what’s more, if such is true and Susanne Wilkinson’s wish, she really does have to ask if she is in the right business. 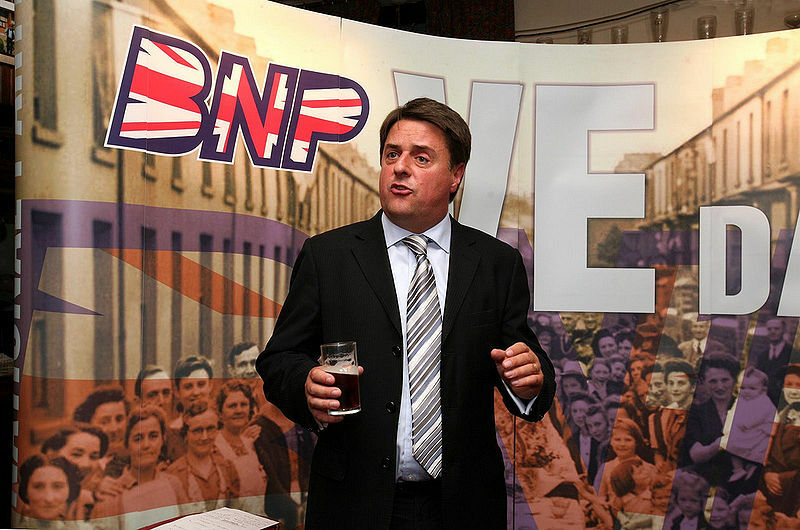 I trust she has a reservation taken for Nick Griffin? Has it been a good week for women? The news regarding one of the UK’s most loved celebrities, Jimmy Savile, has not been good. It is not so much what he did – bad though that seems to have been – more that it was allowed to go on even though many people were aware of it. The fact that a BBC Newsnight report seems to have been ‘supressed’ in favour of a Savile eulogy adds to the sense of cover up. It took ITV to run with it. The consequences have been monumental. Existing female presenters on the BBC have now come out and told of their own experiences with other male ‘colleagues’; for example, Liz Kershaw, formally of Radio 1 – Savile’s former station, told how she was groped whilst on air in the late 1980s and being accused of lesbianism when she complained. Sandy Toksvig made similar claims live on television. Finally, it seems, it is safe to tell the truth. The Savile abuse revelations can never add up to a good week for women; though having it out in the open and engendering some unease amongst the still-living abusers in the BBC and elsewhere is inherently good. 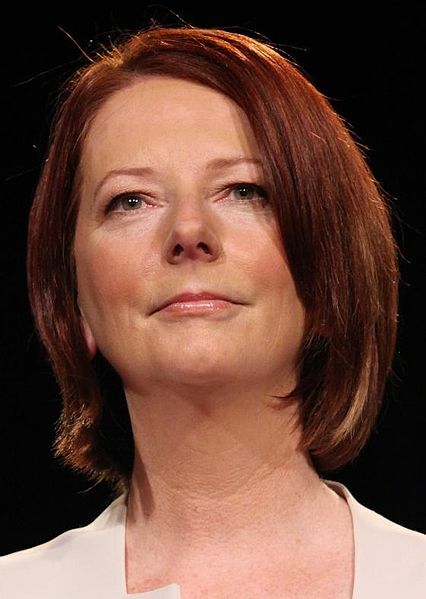 Julia Gillard’s contribution, on the other hand, is empowering. It may have been entertaining at one level, but her ability to demonstrate to so-called colleagues that their behaviour towards her is at the very least bullying was striking. She has stood up to them on her terms. I cannot recall any similar events or instances. I think we should invite her to do the same in the UK – starting with David Cameron and his “calm down, dear” put down to Angela Eagle MP in April 2011. One of the reasons that the Conservative Party is so nasty is because of its inherent mysogyny. The long-fought for badger cull in England is about to start. The plan is to kill – systematically – 100,000 badgers; one third to the UK population. That, to reduce the infection of cattle by 15-20 per cent – not even to eradicate it. 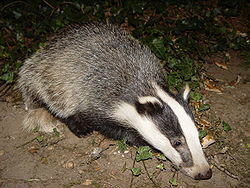 Not surprisingly, David Cameron, the UK Prime Minister, is quoted as saying: “I believe this is the right policy for healthy badgers as well as healthy cattle.” Even though, according to Professor Rosie Woodroffe of the Zoological Society of London “…all the evidence shows that culling badgers increases the proportion of badgers that have TB”. Dead badgers are always healthy. So what is going on? Farmers and landowners have always had a penchant for destroying the countryside and anything else in it that offers a hint of competition to their activities. Foxes and birds of prey are persecuted incessantly on this basis. There is nothing like a land-owner’s whim – backed by the National Farmers’ Union – to base policy. Why do they never look at their own husbandry practices? Mad Cow disease, for example, was the farmers’ own doing. Though, we, the taxpayer, and the cattle, ended up paying for it. Food has always been important for me. Very early on I went vegetarian and against my best interests it was an essential criterion for any girlfriend. Intimate eating with a meat eater suits me not at all. I learned to cook by my first landlord, Patrick. Even though I only lived with him for three months, he taught me the basics of vegetarian cooking. I have a number of staples that I will share in the future, but I am always on the look out for new dishes, especially those that seem counter-intuitive with respect ingredients. Yesterday, I cooked one of those dishes with surprisingly good results. I extracted it from the Guardian life and style section. It is the creation of Angela Hartnett (actually, her head chef, Diego) who is chef patron at Murano restaurant in London. The dish is called aubergine gratin. The counter-intuitive bit is cooking with balsamico vinegar. But it works. Peel the aubergine, discard the skin and dice into large cubes. Toss the diced flesh with olive oil and season with salt and pepper. Roast in an oven preheated to 200C for 10 minutes (I gave it 15 minutes). 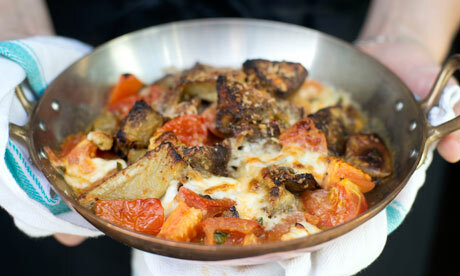 Remove from the oven and toss with the balsamic vinegar before mixing with the tomatoes, olives, mozzarella and basil. Check the seasoning to taste, and return to the oven at 200C for another 5 minutes (for me it needed a bit more time, another 10 minutes, even). I woke up this morning to the not unexpected news that food prices are rising. Particularly wheat. In the UK we are talking about yields being 15 per cent down. 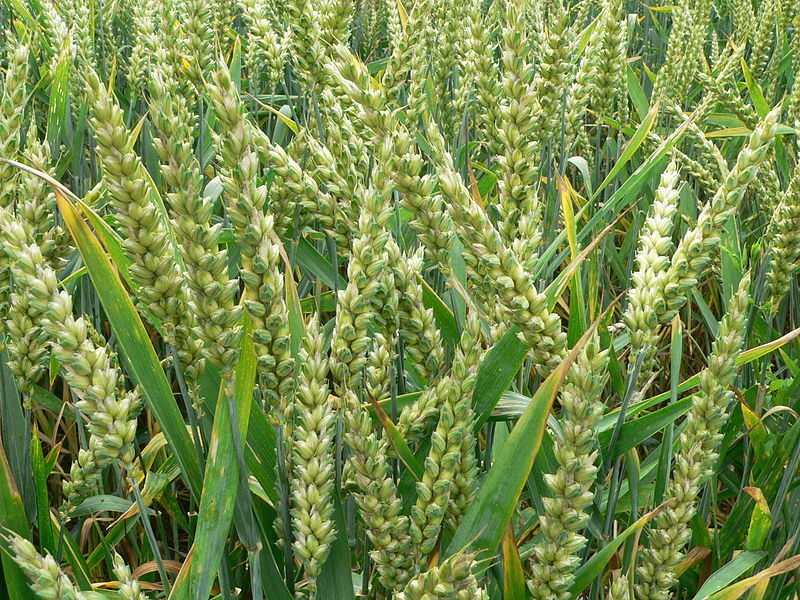 The dry spring and wet summer are the key factors for the UK. Drought in the prairies in the US and Russia have just compounded the situation. Speculators are, clearly, going to do well out of this. It strikes me that a monkey could have speculated on this when the seeds were originally sown. I’m told that it will be hard for poultry and pig farmers as half of the grain crop goes to feeding these secondary sources of protein. I do feel that it is about time that the price of chicken and pork reflected the real world a little better. Maybe more of us can cut down or even eradicate meat from our diets. It is not going to get any better.